Finally, I am firmly opposed to the way in which European Treaties (signed by Labour as well as Conservative governments) have embedded market fundamentalist economic policies into quasi-constitutional law. No doubt this is because the authorities are aware that policies for austerity, privatisation and the financialisation of European economies would be fiercely resisted by the people of Europe, and so had to be buried like concrete, in Treaties. First and foremost, the political situation in Europe has changed – and the continent is now on the brink of fracturing. Market fundamentalism is dividing the people of Europe, and instead of economies converging across the Eurozone, they are diverging. The situation is of course exacerbated by the EU’s ‘free’ market principles for the untrammelled and unmanaged movement of capital, trade and labour. And for the commodification of land and labour. These liberal finance principles have triggered popular resistance, and caused voters to go in search of a ‘strong man or woman’ that will protect the populations of Europe from the ravages of market fundamentalism. Hence the rise of right-wing and fascist parties in for example, France, Hungary and Greece. Right-wing populism – a reaction to, and movement against market fundamentalism – now poses a real threat to European democracy, and to European peace and stability. If the UK votes to leave now, this will encourage those who seek the fragmentation of Europe based not on progressive economic and social policies, but on their very opposite. 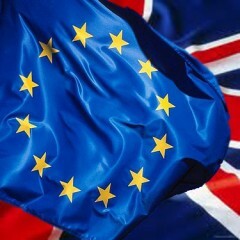 This is therefore not the moment for the people of Britain to trigger the break-up of the European Union. The last time European tensions spilt over into divisions, open confrontation and war, sixty million people died (including twenty million Russians). Britain could not stand aloof from that war, and it will not be able to stand aloof from any future disruption to European peace. I am not prepared to be party to such disruption at such a tense time in European political history. I am not prepared to risk sending my children or grandchildren to another European war. Europe’s social welfare model has been severely strained by Anglo-American policies for de-regulation, privatisation and ‘structural’ changes to labour markets, now alas more widely shared within the EU. Our responsibility for such policies requires that we act responsibly in helping to get them reversed…We cannot now turn our backs on a European economic model that conforms so closely to British economic policies. The social democratic parties, in particular, need to change tack, to promote policies that challenge the neoliberal consensus. This is our task in the coming years. My third reason is domestic – with honourable exceptions, the move to Brexit is led by the most reactionary forces in Britain such as climate change denier Lord Lawson – and it is they who would reap the benefits of an “out” vote. They stand for market fundamentalism, not for the more progressive EU we seek. The EU’s gains on social and labour standards, on environmental protection and climate change – themselves at risk – would be dismantled. I agree with Jeremy Corbyn – we should unite to vote to Remain, but for the opposite reasons from those of David Cameron and George Osborne. If you were in Greece, would you vote Syriza or PASOK? But in Britain…. Posted in: Economy, Europe, International, Macroeconomics, Politics. Putting members in charge of the Party: are we up to it? I can understand some of the reasoning but I will be voting no. what ever the outcome working class women and men will have to fight to stop the attack on their terms and conditions. I will be joining with those that want a fight to construct a Europe that is united to fight for a socialist Europe where the interest of women and men from the working class. I find Ann Pettifor’s analysis and prescription persuasive, and will with grinding teeth vote yes also. I think I believe the difficulty is that both options are about how to manage capitalism in unattractive ways. So it is a difficult choice as to which is less unattractive, and provides more openings for progressive alternatives. Ann Pettifor repeats the arguments for Remain that have been exercised several times on Left Futures and elsewhere – and they are none the worse for that. The mindset that sees only the obvious problems of the EU on the one hand and sets this against some imagined democratic renaissance in a post Brexist UK (probably minus Scotland) comes nowhere near a balanced judgement nor a realistic estimate of the dominant the forces behind Brexit. Even John Major has shown greater clarity of thought in pointing out that in a world as interconnected as ours is sovereignty is always going to be limited and relative (and of course important). And then there is the issue of the future of Europe as a whole and the likely consequences of a break up of the EU. There is remarkably little discussion of this aspect of the issue from the Brexit camp (apart from the fatuous assertion that the EU will be stronger without the UK). Ann Pettifor’s point that the UK has been a leading force in the EU for neo-liberal policies should give left Brexiters to pause for thought as to the likely consequences of exit. Big Business knows which side its bread is buttered on and will wish to stay in the EC dispite a few rogue millionaires. And if we leave why should TNCs stay in he UK, what would be he use of the City of London and as the EC is the second largest investor in the World (behind the US) why should we cut ourselves off from this? So as a socialist why will I be voting to stay in the EC – to fight Neo-Liberalism at a European level. Interestingly if hopefully Jeremy wins, a country like Greece will no longer be fighting alone. So I think we can win a better EC for the European working class/working people – but you have got to be in it to win it! Ooops! The second largest investor in the World in R&D! Oh surprise my non swearing post anti EU get’s deleted AGAIN! This is getting a joke so remember kids if your not pro EU you can’t post her what a joke! If You don’t want to debate why allow posts? I applaud Ann Pettifor for accepting, unlike others, that the EU constitutionalises neoliberalism. But in light of this I don’t find her reasons for voting “Remain” particularly compelling. First, she indulges in her own Project Fear by predicting that Britain leaving the EU will inspire right wing populism and a third world war. I was unaware that the continued presence of a British Prime Minister in the Council and British MEPs in the European Parliament acted as such an effective balm to the extremism of the leaders of Hungary, Poland and elsewhere. Ann ignores that the EU’s entrenched neoliberalism is contributing to the rise of right wing populism. In this regard the EU is reminiscent of the dying Weimar Republic, fanning the flames of fascism and racism by prohibiting more socialistic solutions. Secondly, she feels it is a British responsibility to reverse the EU’s neoliberalism. But in so doing she conveniently ignores the near impossibility of so doing – namely the persistent need for common accord of the 28 Member States to effect any such change. See my recent piece on this blog “Implausibility of a Social Europe”. It speaks volumes that she has nothing to say regarding this insuperable obstacle. Thirdly, Ann does not like the company that anti-EU people keep, singling out Lord Lawson. Like me she is nostalgic about the 1975 referendum where she presumably had no qualms about siding with Enoch Powell. As David Ellis rightly points out what’s so magnificent about being on the same side as Cameron and Osborne, who have proved themselves real class fighters for the ruling class. So this issue is something of a red herring. Jeremy changed his line because of Blairite pressure, not because the EU suddenly improved in September 2015. And the Blairites support the EU because it entrenches capitalism. The reality of the matter is that many on the British left don’t believe in replacing the system of private enterprise with an economy based on public ownership, and this is why they are so flaky on the EU. You seem surprised that someone arguing for Remain should recognise the neo-liberal dominance in the EU. I think that all of the Left Futures articles, and contributions to discussion have recognised that. Your argument that the EU is an unchangeable monolith seems to look at it from outside the context of that balance and battle of class forces. Nothing is set in stone however much the forces of the right may think otherwise. And that is the same logic that we apply to political activity in the UK. Thus when the government moves schools in the direction of privatisation, for example, it sets up all sorts of complications in the way of any attempts to reverse what it has done. With sufficient understanding on the part of the electorate, however, that can be changed. If we are the internationalists we claim to be then we have to believe that is true on a European scale as well. You seem to have given up on left and centre parties across Europe and the possibility of effective joint action with them. One of the key arguments for remain is that the international aspect of class struggle is even more important in our globalised world than ever before. The 1% is an international force. The 99% must be one as well. It is an interesting, if disturbing, reflection on our current scale of values that arguments about alleged anti-Semitism in the Labour Party get more comments than a debate about whether we should leave the EU or not. statement and rebuttal” from which no participant can apparently ever hope to escape to have a fresh look at their assumptions and positions. I would like to thank all (well nearly all) contributors to the EU debate on these pages, which has helped me greatly in making up my own mind (in).